You've come to the right place. Even though this manufacturer is no longer in business, Hot Tub Outpost carries hundreds of Baja spa parts, pillows, pumps and equipment for most Baja spa models. Can't find what you need in the sections above and below? Email a picture of what you need along with your spa model if you know it to info@hottuboutpost.com and we will respond quickly. See our ozonators for a replacement ozone generator for your Baja Spa. If the spa already has an ozonator, you just need to replace the unit with one that operates on the same voltage and has the same plug style. See our spa blowers for a replacement air blower for your Baja Spa. If the spa already has a blower, you just need to replace the unit with one that operates at the same voltage, has the same connection size to the existing air line and has the same plug style. Get factory original replacement Baja spa pillows. Even though the Baja Spa company has been sold, Hot Tub Outpost still carries all original Baja spa pillows, parts and accessories. Baja Spas started back in 1972 and had manufacturing plants in Tucson, AZ and Salisbury, NC. Baja Spas no longer exists as a separate company, but you can still get replacement Baja spa parts for your hot tub through Hot Tub Outpost. We carry a full range of pumps, jets, blowers, filters, pillows and more so you can keep your Baja hot tub running. The most popular replacement Baja filter cartridges are the 50sqft cartridge or the 26 1/2 inch long 100 sqft cartridge. See our full range of still-available Baja Spa control panels. Some Baja Spas used the HydroQuip control panels. Others used Balboa. Many Baja spas used HydroQuip spa control systems. Baja Spas manufactured 3 series of spas: The Sportub series, the Performance XS Series and the Whitewater XS Series. The Sportub Series is Baja's plug and play hot tub line with 120 volt and 240 volt technology. The Performance XS Series are 240 volt spas with additional upgraded features. The WhiteWater XS series is Baja Spa's high end hydrotherapy option. The Sportub plug and play Baja spa line have a quick heat system, cushioned spa pillows and can be plugged into a standard 15 amp, 110 volt outlet or converted to a 40 amp 220V spa. Equipment will vary from a , 1.5 HP pump to a 5 HP pump plus circulation pump, depending on the number of jets. The spas in this series include the following models: The Baja 1050 hot tub has 10 therapy jets, built in chemical feeder and easy access filter, and measures 54"w x 78"l x 29"h. Model 1054 is a 78" square model with 12 therapy jets. Model 1056 is an 88" octagonal spa with 16 therapy jets and a convertible equipment pack. 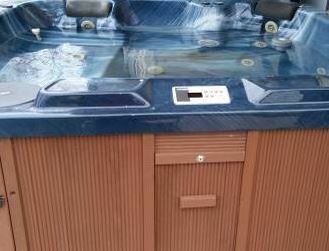 Hot tub model 1057 is also 88" square x 38" deep, with flat corners, extra deep bucket seats and 38 therapy jets. Model 1058 is 88" square x 36" deep, but with 37 therapy jets and a built in lounge. Baja 1059 is 78" x 78" x 29" and contains 12 therapy jets. The Performance XS series by Baja spas have upgraded features like the following: . lighting systems, EON synthetic cabinets, 5.5 KW stainless steel heaters, circulation pumps, 5 HP spa pumps and ozone purification systems. The Performance XS series consists of the following 3 models: Model 1042 measures 78" x 54" x 35", has 27 therapy jets, 12 LED lights and a 240 volt equipment pack. Model 1044 is a 78" square tub x 35" high with 35 therapy jets and 13 LED lights. The Baja 1046 model hot tub is an octagonal 88" spa x 35" high with 13 LED lights and 38 hydro therapy jets. The Whitewater XS Series is Baja Spa's high end hydrotherapy line with 3 pumps: 2 x 5 HP spa pumps and a circulation pump; a 5.5 KW stainless steel heater, Nightscape lighting system, ozone system and cushioned pillows. There are 2 models in this series. Baja Model 1067 has 51 therapy jets and 27 LED lights and deep seats in an 88" square spa x 38" deep. Model 1068 has the same dimensions, but with 50 therapy jets and a lounge seat. See all of our spa parts or enter the part number or item in the search box. Browse by categories and subcategories in the left Category menu. If you are searching in the search box above using a part number that has hyphens, only search on one part of the number - like the last 4 numbers for a refined search.